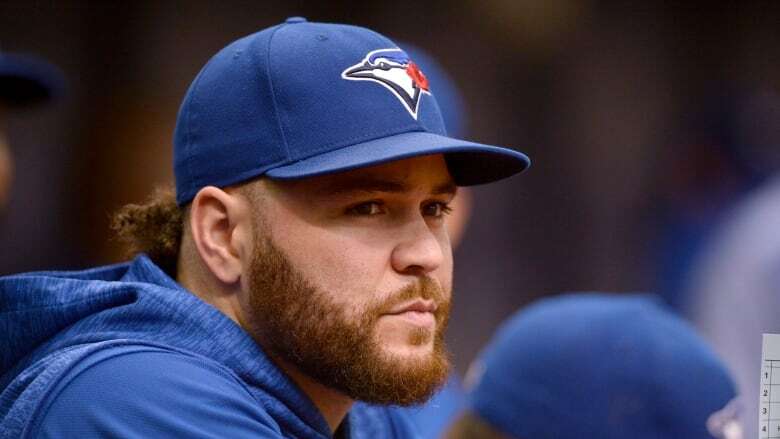 An off-season of change continued for the Toronto Blue Jays on Friday as the team dealt catcher Russell Martin to the Los Angeles Dodgers for a pair of minor-league prospects. The move came a month after the Blue Jays gave another high-priced veteran — shortstop Troy Tulowitzki — his release. Like the Tulowitzki decision, Toronto will be eating a lot of Martin's salary. The Canadian is owed US$20 million this season, but the Blue Jays are sending $16.4 million to Dodgers, according to general manager Ross Atkins. "I want to thank the Blue Jays organization from top to bottom for the opportunity to play in my home country for the last four years," Martin said in a statement. "I am now looking forward to being back with the Dodgers where it all began for me. "I would like to extend a very special thanks to the Toronto fans that followed me every step of the way. I am truly grateful for your continued support." Joining the Blue Jays are right-hander Andrew Sopko and infielder Ronny Brito. Sopko, who played 14 games for the double-A Tulsa Drillers last season, had a 3-1 record with a 3.88 earned-run average. A seventh-round pick in 2015, the 24-year-old has a career minor-league record of 27-17 with a 3.61 ERA with 363 strikeouts over 394 1/3 innings. Brito, 19, split last season between the Dominican Summer League Dodgers and the rookie-level Ogden Raptors, hitting .295 over 61 games. The trade sends Martin back to the team that drafted him in 2002. The 35-year-old from Chelsea, Que., spent his first five big-league seasons with the Dodgers. "He was really excited about it," said Andrew Friedman, L.A.'s president of baseball operations. "L.A. holds a special place in his heart. He wants to win a championship and he talked about how he'll do anything you guys want." Martin signed with Toronto as a free agent in November 2014. He helped the Blue Jays make back-to-back American League Championship Series appearances in 2015 and 2016. The four-time all-star has also played for the New York Yankees and Pittsburgh Pirates over his 13-year big-league career. Martin's numbers have tailed off in recent seasons and his playing time has diminished. He made 90 appearances last season and hit .194 with a 10 homers and 25 RBIs. Martin is slated to become a free agent at the end of the 2019 season. Tulowitzki recently signed with the Yankees for the major-league minimum of $555,000. That will be offset against the $20 million that he's owed for 2019 by the Blue Jays, who are also on the hook to pay him $14 million for 2020 along with a $4-million buyout of a 2021 team option. Toronto is in full teardown mode after two straight disappointing seasons. The Blue Jays finished fourth in the American League East last year with a 73-89 record. The Blue Jays have been stockpiling prospects and will field a young team in 2019 with an eye to returning to contention two or three years down the road. Also on Friday, Associated Press reported the Jays will sign right-hander David Phelps to a $2.5 million US, one-year contract, a deal that could be worth $13.75 million over two seasons. Phelps, a 32-year-old free agent who is coming back from Tommy John surgery, can earn an additional $3.25 million in performance bonuses this year as part of the agreement, and the Blue Jays have a $1 million team option for 2020 that could escalate to $8 million depending on appearances and games finished this year. He tore the ulnar collateral ligament in his pitching arm on March 17 during his final pitch in a spring training outing against the Los Angeles Angels, and he had surgery March 26. Phelps was 2-1 with a 3.12 ERA in 10 relief appearances in 2017 for Seattle, which acquired him from Miami that July 20. He had a $5.55 million salary last season. During six major league seasons with the New York Yankees (2012-14), Miami (2015-17) and the Mariners, Phelps is 30-33 with a 3.89 ERA and five saves in 64 starts and 164 relief appearances.